There are many good people in this world who enrich our lives for no material reward at all. But they remain unrecognised. Until now. KissBank believes it is possible to create a currency based on kindness and good acts. 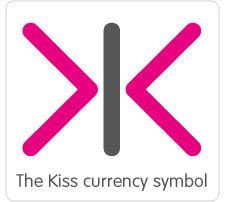 The global unit of this currency is the ‘Kiss’ – which is given for acts of kindness, and received in appreciation. This allows anyone to reward anyone anywhere on the planet – stranger or friend – for being a good person, and making the world a better place for us all to live in. An economy based on kindness – where no money changes hands – will magnify and reward millions of small acts of goodness that go unrecognised every day. KissBank gives you Kisses for free. You MUST give them away. But you get to keep every Kiss sent to you. Forever. Every year on New Year’s Day we will announce the KissBank Rich List – an annual roll call of those who have received the most Kisses globally and nationally from our account holders. KissBank is social networking revolution that recognises acts of humanity – big or small, local or global. There are many truly good people in the world. It’s time they got the reward they deserve – a Kiss. From You.